When I think of carnations, the associations I have aren't particularly appealing. I think of them being the "cheap" flower you get when you can't afford anything else; I think of them affixed to 1970s polyester prom suits; or I think of them in awful dyed colors you'd never see in nature, like pastel green, purple, and...blue. When I first dabbed Blue Carnation on, its sharp and herbal opening salvo was so unfamiliar and harsh (with a prominent anise note) that by the time its predominant, dense clove cigarette accord arrived, I was truly baffled and put off. This stuff is strong! But I love acquiring tastes, and it didn't take long for me to cozy up to Blue Carnation. Or, rather, it cozied up to me. Round, velvety, spicy-sweet clove is a comforting note, not one you encounter a lot in modern perfumes in this strong an incarnation (see what I did there? ), but I could totally see getting hooked on this very dated smelling perfume. Bellodgia is another famous carnation scent, one I will review next, and it is much more nuanced, light, and floral than Blue Carnation, which sings in a lower register than Bellodgia's higher pitched, more recognizably feminine voice. Like perfumes with prominent violet notes, carnation's exotic unfamiliarity takes us back to a different era. It would smell on a modern woman as vintage as alligator pumps and a square-shouldered suit would look on a teenager at the mall. One of my favorite perfume interlocutors, Anne-Marie from Down Under, sent me the same link I sent her last night from (again!) Bois de Jasmin, which included wonderful quotes from perfumer Jean-Claude Ellena's book Le Parfum. The quote she sent me seems most apt for this post: "'Perfume," he writes, "is a product of society and, in this sense, is condemned to die if its myth and its memory are not maintained..."
I like to think that I and my vintage perfume-lovers-in-arms (noses?) 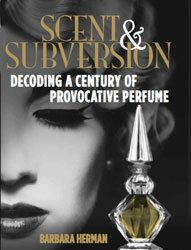 are doing our best, one drop and dram at a time, to halt perfume's death sentence the best we can. *More from Bois de Jasmin: "Produced mostly in France and Holland, carnation absolute is rare, with a heavy, spicy floral aroma tinged by sweet dark honey notes. It is a blend of clove, black pepper and exotic sweetness of ylang ylang, which incidentally are often used to reproduce carnation scents...In perfumery, it is common to employ synthetic substances like eugenol, isoeugenol and eugenyl acetate to accentuate floral character and to lend a clove and carnation-like scent." ** Roger & Gallet is a Parisian perfume house that's been around since 1862. Cleopatra's Boudoir perfume expert lists those perfumes some of which, in contradiction to that date, start on her list in 1806. So thrilled to hear that you will be reviewing Bellogia next and secretly hoping that you will stay on the Caron theme and review Fleurs de Rocailles and Nocturnes de Caron as well. Caron is a true perfume house that I feel is often overlooked. Did you know that in the Caron perfumery salon in NYC you can actually decant from 13 boutique perfumes housed in quite large Baccarat fountain flacons? A perfume with a carnation note almost always suits me, which is, I think, one of my biggest scent surprises ever. Especially as I don't much care for the scent of the actual flower. Have you tried Blue Carnation, Isis? What's your favorite perfume with a carnation note? Hi breathe31. It's funny because I smelled Bellodgia before Blue Carnation, and set it aside because I didn't like it. But once I got used to the heavy-sweet scent of Blue Carnation, and could appreciate its beauty, I revisited Bellodgia and realize how subtle and multifaceted it is. So I'm glad Blue Carnation's intensity paved the way! I would love to review Fleurs de Rocailles and Nocturnes de Caron. If anyone wants to send me decants...(hint, hint!) Otherwise, off to eBay I go...Also, I've heard about the Caron salon. Not sure why I never visited! Sounds fantastic. Thank you! How sweet of you to say that about my blog! No, I haven't tried Blue Carnation yet, but now it's definitely on my wish list! My favourite with carnation is a perfume oil from Black Phoenix Alchemy Lab called Horreur Symphatique. But then it only have notes of win for me; blood musk, honey, black wine, champagne grapes, tobacco flower, plum blossom, tonka bean, oakmoss, carnation, benzoin, opoponax and sugar cane. Hmm. It was great to try the sample of Bellodgia you so kindly sent me, but I didn't love it, despite my curiosity. It seemed to turn a bit soapy? So maybe Blue Carnation would suit me better. I love cloves. I have no idea what plant cloves come from. Same family as carnation? Must do some research. A department store near me stocks a few Roger and Gallet fragrances, mostly rather thin, watery stuff designed to please everyone, and so satisfying and loved by no-one. But the bath and body products do look quite nice. Is Roger and Gallet one of those companies that have gone cheap and mainstream in recent years, do you think? Or was it always mainstream? I can't quite place it. Bellodgia was horribly soapy on me as well. I would love to try Blue Carnation (you're right, it's ridiculously spendy on teh Bay), since I adore carnations both fresh and in fragrance. I have a small treasured decant of Floris Malmaison - originally a masculine scent and now discontinued, due to restrictions on eugenol. My favorite carnation scent is DSH Oeillets Rouges, which I thought was also ridiculously expensive until I went pricing carnation absolute, which OR contains a fair percentage of. Anne- cloves are the sundried flower buds from a tropical tree of the myrtle family. Carnations are flowers-the absolute is difficult to obtain making it extremely expensive. Roger and Gallet was founded (as a perfume house and perfume supplier to Napoleon) in 1806 by Jean Marie Farina, a descendent of the inventor of Eau de Cologne. In 1862,Armond Roger and Charles Gallet took over the perfume operation and expanded into skin care and soaps. The company was purchased by L'Oreal in 2008, hence the mainstream production. Thanks Breath31, the word l"Oreal explains all. It might also explain why I never saw R&G products in Australia until quite recently. L'Oreal could distribute to the Moon if they wanted to. And all this talk of carnations has made me interested in them again. Barbara, I'm so envious of your flea market haul, by the way. Grrr. I'm glad you finally got a chance to try Blue Carnation (and I'm envious of your flea market haul!) My mother had this and I remember it as much more well-rounded and complex than just "all cloves, all the time", but the two bottles I have bought from eBay have fit that description pretty well. I wonder if my memory is at fault or if it just tends not to age very well. I suspect it is the latter, as I do have a small jar of powder (not dusting powder, more of a sachet powder or dry perfume) and it smells much closer to what I remember. I guess what I remember about Blue Carnation (and can detect in the powder) is not so much a matter of different notes but just a different balance. The BC I remember definitely had a clove note, it just didn't overwhelm the perfume. The clove had less presence, and the other notes had more presence, than in the two bottles I have. I seems as if the other notes may deteriorate more over time, while the clove survives, so that in time the perfume becomes more and more clove-y smelling. I wonder if it may be an issue of photosensitivity. Many women keep their bottles of perfume out on a vanity or dresser, exposed to the light, whereas the jar of powder may have likely been kept in a drawer or cabinet, away from the light. Perhaps some of the ingredients in BC decompose readily with exposure to light. As for Bellodgia, I have a relatively new bottle of EdP and a vintage bottle of extrait. I don't like the EdP precisely because it is too much clove. I bought it because I thought the EdT in the tester was too watery, and I hoped EdP would smell the same but stronger. I didn't realize it was a different composition (with way more clove!) and wish I would have bought the EdT and just used it lavishly. The vintage extrait, however, is gorgeous, although not very long-lasting on my skin. I don't get why people don't like carnations. I think they are durable and smell lovely. And they are cheap because they are ubiquitous. Well, so what? Lilacs and honeysuckles are everywhere, and I think they smell much better than roses. The rare-is-better school of thought doesn't always fly with me. Hi Joan, I don't usually like carnations not because I subscribe to the rare-is-better school of thought, but because I don't like carnations! (Well, the way they look, anyway.) But I'm warming up to the smell of carnations, or cloves, or some mix of the two...As with violets, I think most people just aren't used to smelling them in perfume, so it takes some getting used to. I hope you don’t find it too awful! Hi Joan! I agree wholeheartedly about carnations being durable. They last such a long time in the vase, I feel that I really get my money's worth. I once had a bouquet of carnations (from the grocery store at that) last for a full three weeks in the vase! Unfortunately, lilacs and honeysuckle are NOT ubiquitous where I live. I don't think I've ever seen either one in real life. We do have a lot of jasmine, though, and that stuff is remarkably potent. Just a few blossoms will perfume an entire backyard. Does anyone know where I can buy Blue Carnation perfume? 50 years ago it was my favorite but haven't thought of it till just recently as we're preparing to celebrate our 57th wedding anniversary. Thanks. Napoleon was a wholehearted user and had a boot flask specially made for him to carry in his boot - the flask was called the "Rouleau de l'Empereur". You can find more info and a full range of Roger Gallet products online on our website. I love this blog! I once bought a bottle of Blue Carnation dry perfume from an antique shop for a few dollars. It was full and sealed. OH! Heaven!! It was fabulous, so spicy but with a mellowness. I used the entire bottle in a couple of years, and have been searching for it ever since. I have never smelled the true perfume version, only the dry powder perfume.